This morning I had the privilege of leading morning worship and preaching at Elm Park Baptist Church. The pastor, Colin Phillips, has started on a series of talks studying the “Names of God” and suggested I could speak on the names of Jesus. And this is what I did, although in the time allowed I actually only talked about Jesus. I understand that Colin has started as series of talks on the names of God. So I thought it would be appropriate to look at the name of Jesus. As we established earlier in our children’s talk everyone has a name. John means “God is gracious”. Jesus which means “God saves” or “God is salvation” was a fairly common name at the time of Jesus. But as we heard the angel Gabriel tells Mary her son is going to be very special. What about all the wrong things you’ve said and done? Or perhaps the good and kind things you just didn’t do? Or what about all the evil things people get involved with, which look so innocent? Ouija boards, seances, fortune telling, tarot cards and the Charlie, Charlie challenge. All of which are very dangerous. The Bible makes it very clear that God’s people are to have nothing to do with any of this stuff. In English law there is something called the Statute of Limitations which basically says that you have 12 years to go after someone for a debt they owe you. After that you can’t do anything. However with God there is no such get out. You are answerable for every misdeed; every wrong thought you ever had. It’s like going round the supermarket putting goods in your trolley. You can pile it high, but there comes that awful moment when you arrive at the checkout, and the reckoning begins. Every item has to be paid for. There is no putting stuff back on the shelves or telling the cashier you’ve changed your mind and don’t want certain items. Each and every item goes through the scanner and you are told the price. So how do we deal with all this sin? Many people ignore it and hope it will be alright on the night. Others try and argue their way out of the corner. If God is loving then he wouldn’t punish us. He’ll let us off and we’ll be okay. You’d be amazed the number of folk who assure me that their loved ones are in heaven because they were good people. Oh he wasn’t a Christian but he was a good man and led a Christian life style. You can only live a Christian life by being a Christian – acknowledging that you cannot save yourself, and that you accept that Jesus has paid for your sins. One man once told me that he lived a Christian lifestyle. He ran a cycle shop. So I asked him if I lived a Cyclist’s lifestyle, dressed in spandex, wore a cycle helmet, carried a water bottle and talked about different designs of bike and gear sets would that make me a cyclist. No it would not. I am not a cyclist until I get on my bike and pedal! Other folk assure me that all religions are the same as they all worship the same God. Jesus gave as a yardstick to see if that was true. See John 5:23 “He who does not honour the Son does not honour the Father, who sent him.” So if people merely say Jesus was a good man, or a teacher or a prophet or even an archangel, they have got it wrong. Unless you acknowledge that Jesus is the Son of God, you have got it wrong. It’s a bit like standing out by the bus stop in Rosewood Avenue. near to the church. If you want to go to Rainham, then the 165 is the bus for you. Its no good hoping for the No 5 to take a diversion on its way from Canning Town to Romford to pick you up and take you to Rainham. Its just not going to happen. Not all buses go to Rainham and not all religions take you to God. Jesus is the only way. So how does Jesus bring salvation? The Bible tells us that there is no forgiveness without the shedding of blood. 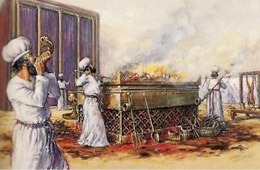 The old Jewish system of sacrifices may bring God’s forgiveness for the wrong things we have done, but straight away we sin again. There was a never ending cycle of: sin, sacrifice and forgiveness. Jesus’ death on the cross was the one perfect sacrifice that could bring lasting forgiveness for all the sins of the world and bring us peace with God. Jesus is the only human in history who has led a perfect sinless life. 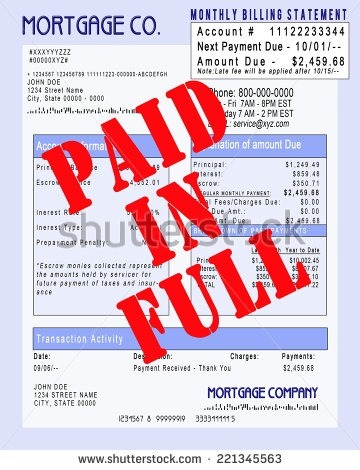 I understand that the original Greek for “it is finished” meant “Paid in full”, what you may write across a paid invoice or statement of account. And that offer is available to anybody who wishes to accept it. 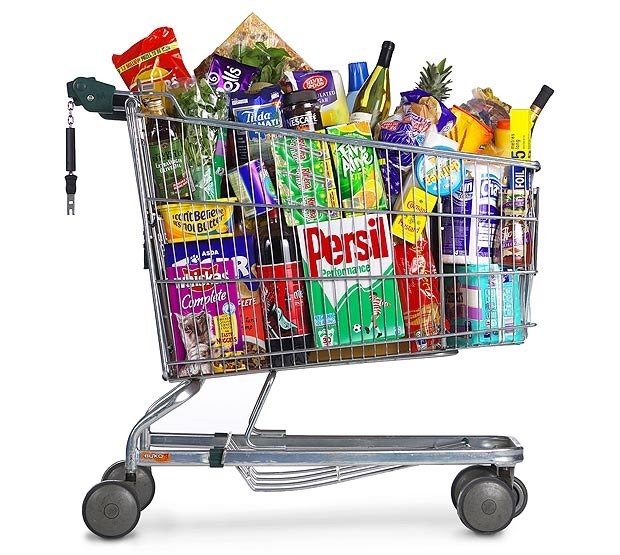 Getting back to our supermarket trolley full of sin, it is as if Jesus walks up to the customer at the check out and says “Would you like me to take care of that for you?” If you say yes to Jesus, then the bill is paid and you can go free. Jesus also came to save us from the Devil who has been at work deceiving and misleading people since the days of Adam and Eve. A family I visited this week told me that the now deceased lady was very spiritual and had been into “healing”. Sadly she had been a Christian but had gone the way of eastern spirituality, and she sought out healers from all over the world to heal her cancer. She was a firm believer in the healing power of magic crystals. And as Christians we can have Jesus’ authority and the power of the Holy Spirit to help us in each and every situation we face. So we are to act under his authority, the highest power in the entire universe and to expect to see things happen.. Whilst sadly many men and women do not acknowledge Jesus’ authority here and now, there will be a day when they do, either joyfully because they are believers or because on that day it is obvious who Jesus really is and they no longer have a choice.. I once talked to a lady who some years before had been fascinated by “automatic writing” where a demonic spirit gets into a person and they start writing prose, verse, essays etc. She allowed the spirit into her and started writing. The lady said eventually she could not stop it. Her husband told the spirit that he was the householder and that the spirit was not welcome there and had to go. Of course it did not. Fortunately a local Christian minister was called and he commanded the spirit to go in the name of Jesus and it went straight away. There is no other way to get rid of evil spirits. We do hear of silly people who think that you have to assault the possessed person, pour boiling water on them or rub chilli peppers in their eyes and then shout loudly at the demon. What dangerous nonsense. You follow the model you will find in the Bible which is to command it to go in the name of Jesus. Just as an ambassador acts on behalf of his or her country, under the authority of the government, so we Jesus’ followers can act under his authority as King of Kings and Lord of Lords. I have been preaching the Word of God for more than 25 years. Also I am an Independent Christian Funeral Minister working mainly in the eastern outskirts of Greater London for the last 17 years. I have been married to Gaynor ( a very caring and dedicated nurse) for more than 35 years and we are blessed to have four sons. So I am aware of many of the joys and sorrows of family life.. This entry was posted in Talks and tagged cross, forgiveness, God, Holy Spirit, Jesus, sacrifice, salvation, sin, sins. Bookmark the permalink.